“Worldwide, the majority of maternal and newborn deaths occur around the time of birth, typically within the first 24 hours after childbirth,” WHO said in its announcement. “Most of these deaths are preventable,” the agency stressed. The agency’s new Safe Childbirth Checklist and Implementation Guide targets the major causes of maternal and newborn complications and deaths, including post-partum haemorrhage, infection, obstructed labour, preeclampsia and birth asphyxia. WHO said of the more than 130 million births occurring each year, an estimated 303,000 result in the mother’s death, 2.6 million in stillbirth, and another 2.7 million in a newborn’s death within the first 28 days. 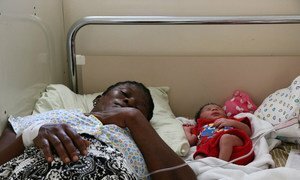 The majority of these deaths occur in low-resource settings, often lacking skilled birth attendants, it said. The checklist “synthesizes existing evidence-based WHO guidelines and recommendations into a single and practical bedside tool targeted at improving adherence to best practices, including adequate communication around the time of delivery,” the agency said. WHO said the checklist was first piloted for usability in nine countries in Africa and Asia. In September, all countries agreed to a new set of Sustainable Development Goals, which include targets to substantially reduce global maternal and newborn deaths. To advance this agenda, WHO and partners also launched a new Global Strategy for Women’s, Children’s and Adolescents’ Health 2016-2030, a roadmap for countries on what evidence-based investments and actions are required to end the preventable deaths of women, children and adolescents’ and to improve their overall health and well-being. The checklist was developed and tested in partnership with Ariadne Labs, a joint centre of Brigham and Women’s Hospital and the Harvard T.H. Chan School of Public Health and supported by the Bill & Melinda Gates Foundation. Maternal mortality has fallen by 44 per cent since 1990, United Nations agencies and the World Bank reported today, giving fresh impetus to efforts to reach by 2030 the virtual elimination of women’s chances of dying from pregnancy-related causes as part of the new UN Sustainable Development Goals.